Alden started playing trombone in grade seven band and shortly thereafter took up the tuba and the euphonium. He enjoys playing all styles of music and can be found performing in churches, concert halls, bars and occasionally on streetcorners. 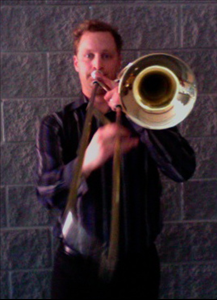 After pedaling to Mexico with a trombone strapped to his bike in 1998 he attended the University of Alberta (BMus 2003) and subsequently studied music in Banff, France and Toronto. Alden teaches at the Alberta College Conservatory of Music, Red Deer College, Camp Nakamun and MusiCamp Alberta.